^ Whiteley (1979); Stewart (1980), p. 15. 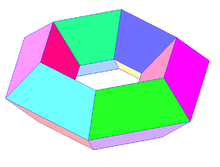 ^ Webber, William T. (1997), “Monohedral idemvalent polyhedra that are toroids”, Geometriae Dedicata 67 (1): 31–44, doi:10.1023/A:1004997029852, MR1468859 . 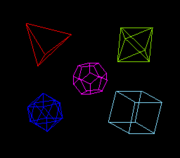 ^ Whiteley, Walter (1979), “Realizability of polyhedra”, Structural Topology (1): 46–58, 73, MR621628, http://www.iri.upc.edu/people/ros/StructuralTopology/ST1/st1-07-a4.pdf . ^ Császár, A. (1949), “A polyhedron without diagonals”, Acta Sci. Math. Szeged 13: 140–142 . 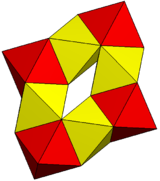 ^ Ziegler, Günter M. (2008), “Polyhedral Surfaces of High Genus”, in Bobenko, A. I.; Schröder, P.; Sullivan, J. M. et al., Discrete Differential Geometry, Oberwolfach Seminars, 38, Springer-Verlag, pp. 191–213, arXiv:math.MG/0412093, doi:10.1007/978-3-7643-8621-4_10, ISBN 978-3-7643-8620-7 . ^ Szilassi, Lajos (1986), “Regular toroids”, Structural Topology 13: 69–80, http://haydn.upc.es/people/ros/StructuralTopology/ST13/st13-06-a3-ocr.pdf . ^ Webb, Robert (2000), “Stella: polyhedron navigator”, Symmetry: Culture and Science 11 (1-4): 231–268, MR2001419, http://www.software3d.com/PolyNav/PolyNavigator.php . ^ Stewart 1980, p. 15. ^ Stewart 1980, pp. 76–79, "Quasi-convexity and weak quasi-convexity". ^ Grünbaum, Branko (1994), “Polyhedra with Hollow Faces”, Polytopes: Abstract, Convex and Computational, NATO ASI Series C: Mathematical and Physical Series, 440, Kluwer Academic Publishers, pp. 43–70, doi:10.1007/978-94-011-0924-6_3, https://books.google.com/books?id=gHjrCAAAQBAJ&pg=PA43 . See in particular p. 60. Weisstein, Eric W. "Toroidal polyhedron". MathWorld（英語）.